Over a decade ago, my dad sat down to write out his memories. The resulting document sits in an pale green folder on my bookshelf now as one of my most treasured possessions. In it, he describes the cocoa paste sandwiches his mom packed for lunch each day, the novelty of the canned biscuits his Grandma made, and how his dad got laid off most winters from his construction job and resorted to hauling wood for meager pay. Under a section called, simply, Vivi, he describes at the hot summer night at Gooch’s, a little soda shop in the tiny town of Piedmont, Missouri, where he drove up and saw my mother for the first time. I saw a beautiful blond, tanned girl that I had not seen before. She was very pretty, and I caught her eye as soon as I drove in. After asking around, I found out she was Vivian Roberts and was in town visiting her cousins. I quickly asked her out . . . I knew I was in love, the moment I saw her. We wrote letters to each other every day. I called her when it was possible. Kansas City was a good 6 hour drive from Piedmont. Viv was living in a rough situation and her dad treated her like dirt. It seemed like we would never be together. We both prayed for a solution. The solution came in an unexpected way. 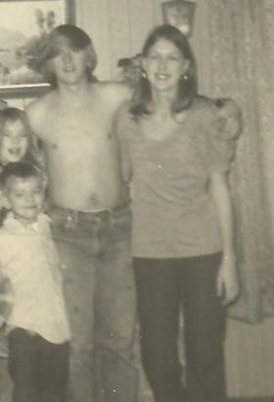 My mom’s dad came home after drinking one night and beat her badly, tearing out fistfuls of hair. After getting a sobbing phone call from her, Daddy got in his Torino and made the 6 hour drive in 4 hours to pick her up and bring her back to Piedmont to live with her grandmother. Finally in the same city, Dad says, “I was in heaven. I could date Viv, and see her every night. 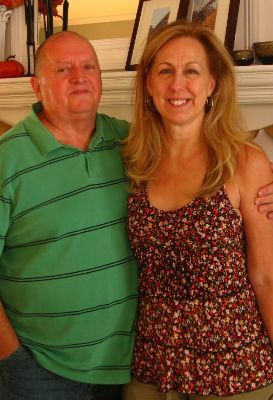 I fell quickly and deeply in love with the girl I wanted to marry.” They were married shortly thereafter at the First Church of the Nazarene in Piedmont, my mother only 16 years old. The third challenge in Project Food Blog, a competition to find the next food blog star, was to create a luxury dinner party. It just so happens that this challenge fell on my parents’ 39 year wedding anniversary. Thank you so much for voting in the first two challenges to get me to this point, where I had the privilege of creating a special meal to honor my parents’ marriage. I wanted to take that night at Gooch’s soda shop and my parents’ memories from growing up in the 1960s and elevate them by creating luxury versions of several classic American dishes. My four course menu featured all-American favorites such as pizza, popcorn, nachos, burgers and fries, and of course, apple pie — fancied up, but still retaining their classic charm. The amuse bouche truly amused my bouche — each component sung in the bite to produce a harmony that tasted exactly like a fresh Margherita pizza. The appetizers, though, were disappointing. Food blogs represent genuine, real people who are dancing through kitchen highs and lows along with their readers — so I’m not afraid to tell you when things don’t work out. My Saffron Buttered Popcorn only carried the lovely saffron flavor in certain bites and my nachos were dry. Nevertheless, we trekked on to the main course and were rewarded for our diligence! Served in sweet diner trays (download the template here, print them on cardstock, cut, fold, and glue together. Adapted from Bakerella‘s smaller version), the “burgers and fries” were leagues above your standard diner fare. The roast was perfectly cooked, juicy, and flavorful, and every accompaniment pulled its weight to make the sliders a true indulgence. I actually forgot the caramelized onions on my dinner party version (they were sitting in a container right behind me, too! 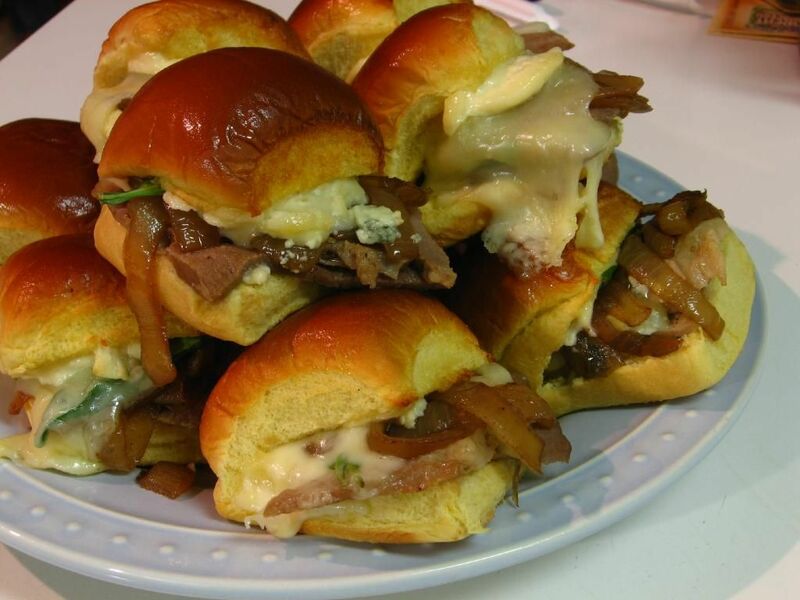 ), but remade the sliders that evening with them included just to taste. They were dynamite with and without the onions! The herb-salt roasted fingerling potatoes carried a hint of fresh lemon with every bite — delicious. 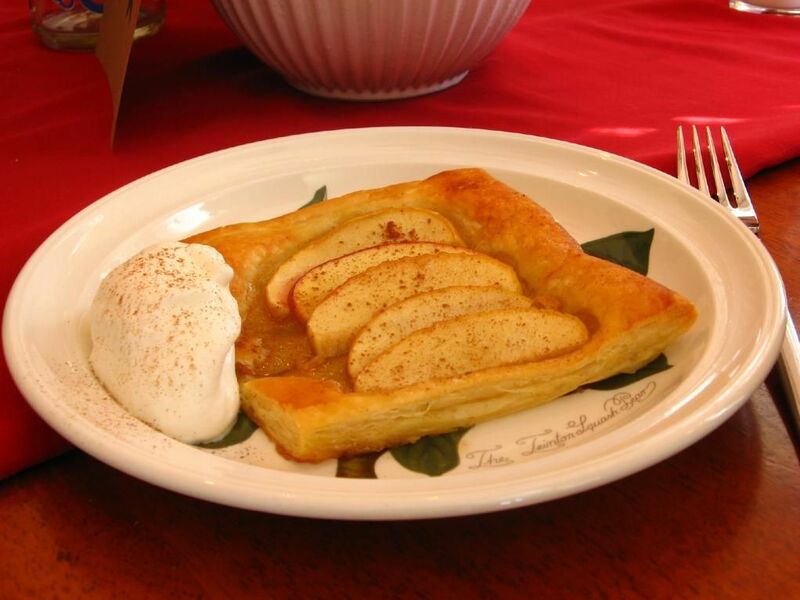 After a break for conversation, guests sat down to a fresh, light apple puff pastry tart. While everyone loved the tart, the consensus was that the star of dessert was the freshly whipped almond cream on top. The food was good, the company was fabulous — but my favorite part of dinner was watching my parents read the quotes I had framed for them. A few days before the party, I’d asked each of them to tell me their favorite memory together, but to keep it a secret from each other. Imagine my surprise and delight (I’ll admit, there were a few happy tears) when they both emailed me the exact same memory. Memories sent by mom and dad and framed for the party. 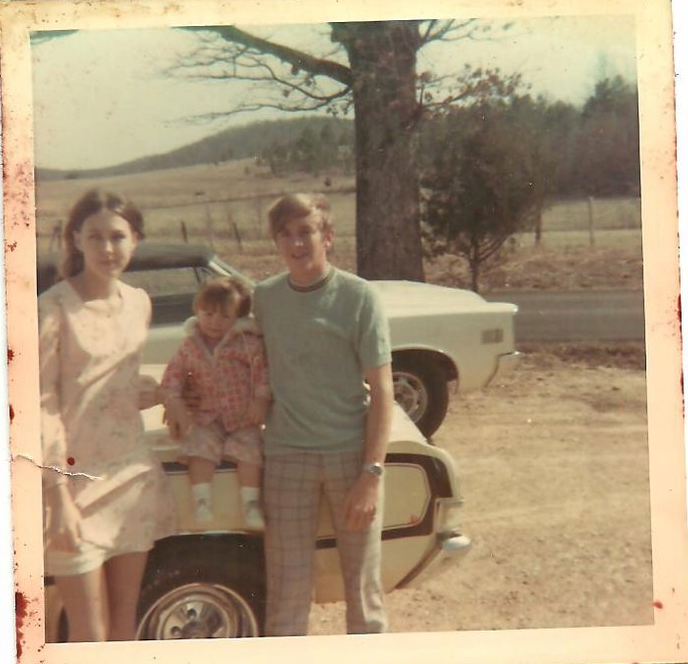 It was of a time when, according to Daddy, they were “so poor but so happy.” Mom was pregnant with my oldest sibling, Jason, and they lived above a hardware store next to some law offices. At night, after the lawyers had gone home, they would slide through the hallways in their stocking feet, laughing together. It’s a memory that, along with a love as strong as my Grandpa’s lumber-hauling hands and as sweet as my mom’s teenage smile, still unites them after 39 years. Note: Voting for Round 3 is now open! Please log into your Foodbuzz.com account (or register if you don’t yet have one), go here, and click “Vote for this Entry.” Thank you! Prepare the roast beef: Preheat oven to 375 degrees F. Let roast sit out for an hour before cooking so that it begins at room temperature. When ready to begin, rinse the roast and use a sharp knife to cut 8 small incisions over the surface, inserting a sliver of garlic into each. Rub the roast with olive oil and season both sides with salt and pepper. Place roast in baking dish with lid (or you can use Elise’s on-the-rack method) and bake for 30 minutes at 375 degrees. After 30 minutes, turn heat down to 225 degrees F and continue cooking uncovered until a meat thermometer reads 140 degrees (Elise says this takes 2-3 hours, but for me, it was more like 1.5 hours. I was nervous that I might need to slow it down, but it came out perfect. So just keep an eye on it). Remove roast from the oven and tent with foil. Let rest at least 15 minutes before slicing into very thin slices. Increase oven temperature to 400 degrees F at this point, in preparation for the sliders. While the roast cooks, caramelize your onions. Heat a large skillet over medium-high heat and add the oil. When it’s hot, add the onions and stir so that they all come into contact with the bottom of the pan. As they start to brown, stir them every 15-30 seconds. Add balsamic vinegar and stir. Continue to brown for 10-20 minutes until they’re well caramelized. In the meantime, prepare slider assembly line. Set out baby arugula, Gorgonzola cheese, Swiss cheese, and mayonnaise. Set slider buns onto a baking sheet. On each bun, place roast beef and all the toppings, including caramelized onions. Brush tops of sliders with melted butter and bake at 400 degrees F for about 10 minutes, or until melty. Serve warm. Sliders with caramelized onions added! Pick a personal theme. Think of a special memory, book, or food — something that resonates with your guests of honor. Plan your party around that theme. In this case, Gooch’s soda shop was the foundation of my party plan. Get creative with your resources. I decorated my table with a curtain panel that was $3 cheaper than an actual tablecloth. 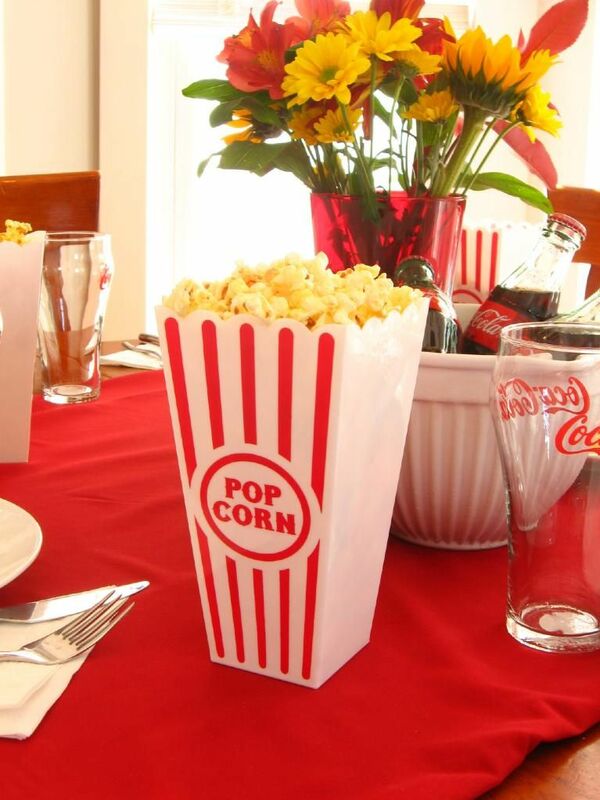 A local dollar store provided fun popcorn containers and drinking glasses. I picked recipes with simple ingredients and used a few luxury items (saffron, Gorgonzola) to elevate them. I also created many party decorations out of paper. Plan ahead. A week before the party, I made a list of all groceries and planned out prep work for each day. I also wrote a detailed plan of party day, including what times to prep, bake, and photograph each dish. When possible, choose dishes that can be prepared ahead of time. I didn’t follow my own advice this time, but the beauty of many desserts and appetizers is that they can be prepared in advance and refrigerated until served. You’ll have more fun if there are only a few things to prepare at the last minute. 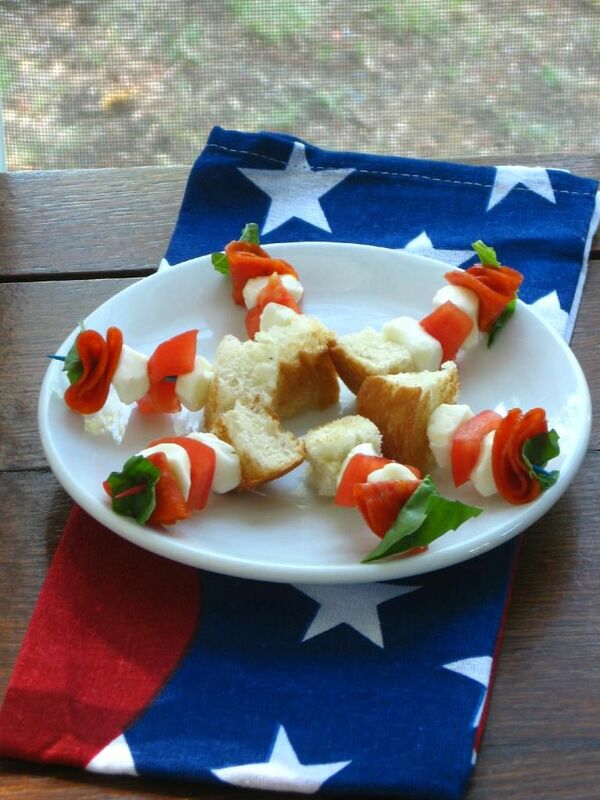 i’d love to be a guest at your dinner, everything looks delish! I love everything about your post and your dinner! So sweet. I can’t wait for voting to open up so I can give you another vote. Thank you so much, Brandie!! Wow girl all this looks so amazing!!! The story about your parents though made me cry!! They look awesome then and now!! Now that is a lovely story. Omg their both sending you the same memory is too cute. Loves it. Table and food look fab! This was such a lovely post with such a sweet story behind it! How serendipitous that this challenge fell on your parents’ anniversary. I love that you recreated good old American fare for them. It all sounds glorious. Sounds absolutely delicious, and the writeup was just beautiful. Congratulations to your parents, may they have many more happy years ahead of them! Thank you so much, Otana! That is the sweetest thing. Your parents are lovely, and as always the food looks amazing! Your posts always make me teary-eyed. You are so honest and down to earth. I love the theme of your dinner. Your parents must have loved it too. The food photos are gorgeous, but the old photos of your parents added such a sentimental touch. Best of luck in this round, Julie! Aw, thank you so much, Megan!! So sweet! Happy anniversary to your mom and dad! Your dinner for them sounds wonderful. 🙂 I love the look of those sliders! I love this anniversary party and the story behind your parents getting together. They look so sweet together, and you wrote the post too well that it got me all sentimental! Love your American classics too, I’ll be reserving a vote for you. 39 years? That’s a huge accomplishment! Congratulations to your parents! And congratulations to you for pulling off a wonderful dinner party! Well done! What an awesome story of love lost and reclaimed. And the burgers look pretty damn good too! What an awesome blog you’ve got here. A lovely and touching story of your parents, and the fabulous dinner party you threw them. Simply divine. Julie, This post is beautiful. You look just like your mother! I’m so excited to be voting for you! Your father’s wonderful line about being young and “so poor but so happy” reminded me of the line from Hemingway’s _A Moveable Feast_: “This is how Paris was in the early days when we were very poor and very happy.” I’ve thought about that sentiment a lot lately, as part of a young couple who hopefully are as “poor” as we’ll ever be together right now, yet happier than I can imagine. It’s funny how it works that way. This post is amazing, every piece of it. Thank you so much, Mary Beth <3 I almost wonder sometimes if the experience of being poor together galvanizes you into a fierce sort of happiness. Your mom looks just like she did in the original picture! 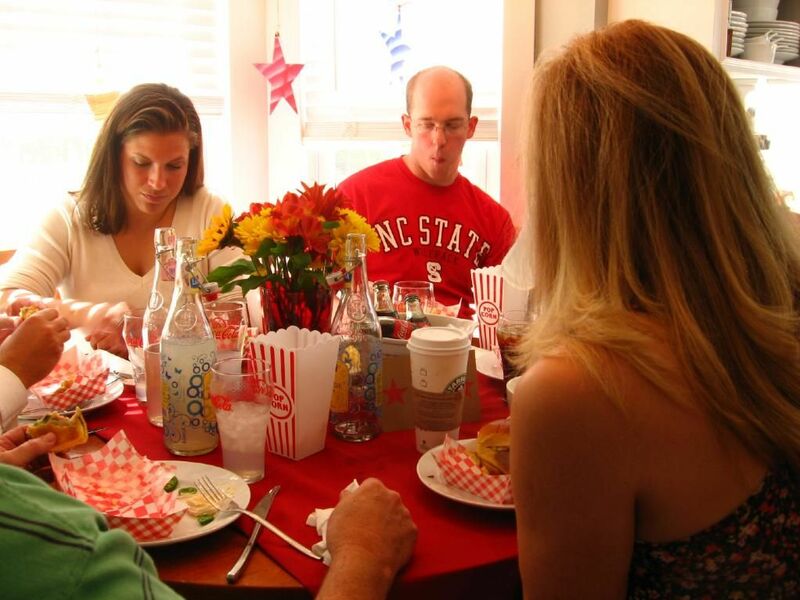 It looks like it was a wonderful celebration with delicious food and fond memories. Good luck, I hope you move on! Thank you so much! 🙂 By the way, a panini party is SO right up my alley! Just opened your post and can’t wait to read it! What a wonderful way to celebrate your parents’ anniversary! 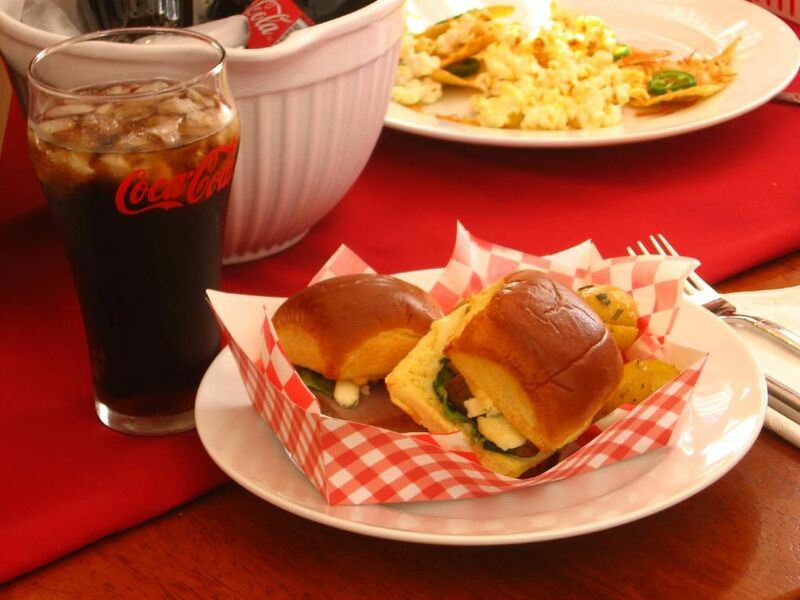 Sharing such touching memories and eating yummy fancy sliders! Congrats…you’ve got my vote again! This is such a thoughtful entry! A beautiful tribute to your parents. 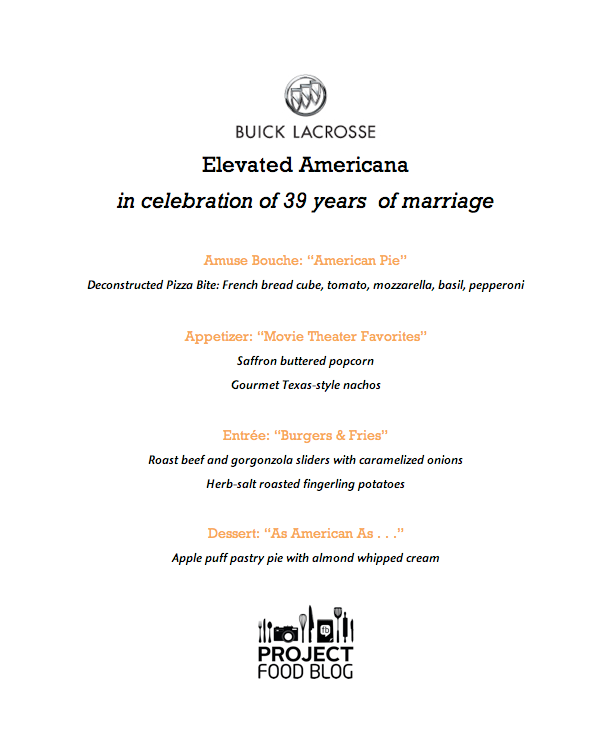 I love the “elevated Americana” theme. The sliders, especially, look fabulous! Thank you so much! We loved those sliders! So gorgeous! It looks elegant, fun and delicious!!! What an amazing story and the party looks so fun! Those sliders are adorable! You have my vote! Thank you for sharing your parents’ story and allow us to be a part of the anniversary dinner. Great menu concept, creative and original. You got my vote. Good luck! Darnit all for making me cry!! That was absolutely beautiful 🙂 Beautiful! Fabulous post. Thank you so much 🙂 I loved yours too! What an amazing couple! I love your idea for the menu… I was almost crying reading the introduction. I voted for you again – Good Luck! You moved me to tears, what a beautiful story. 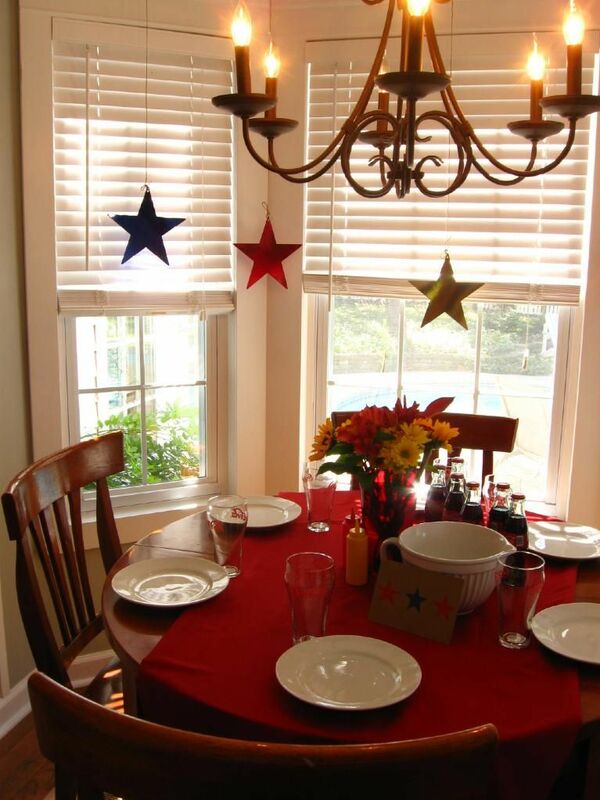 I loved your dinner party idea, the favorite memories and framing the quotes. You have such a beautiful heart 🙂 Everything is just so touching. Thank you for sharing…wow. And of course I am voting on this post. Looks deeeeelish! Love your post Julie. Very personal touch. Your table, and food look great!! Best wishes…. Love! I teared up a bit, if I’m being honest. Thank you so much! 🙂 Means so much to me! Very touching and whimsical too! What a nice tribute to their love..thank you so much for sharing and good luck ! Thanks for stopping by my blog I’m heading over to vote for you now !! What a lovely story about your parents and I love that you planned the menu and decor with their back story in mind. Everything about this whole post is so sweet – I love it! Good luck in PFB! Thank you so much, AJ! Yes, (this is Julie’s Mom) we DID love it! Everything was lovely and so delicious! My favorite was the dessert, or course, (as usual) but everything was not only great tasting but also presented uniquely! Many thanks to Julie for the nice dinner and all her planning and hard work. Our story is one for the books… We are blessed by God and know it! 🙂 Running on Butter (love that name!!) Julie does have a beautiful heart, and Mary Beth, I love that Hemingway line! So fitting! Thank you all for your lovely and thoughtful comments!! Aw, thanks SO much, Sues 🙂 I’m clicking over to read your blog post right now! What a sweet story! I love the pictures of your parents! I absolutely LOVED this story Julie! I’m so glad that your dad found your mum not only to save her but now we have you! 😀 best of luck with the competition-you’re a total winner to me! wow. what a wonderful story and such a special tribute to your parents! this is by far one of the best entries i’ve seen! Thank you SO much, Natalie — what a sweet thing to say!! Aw, dude, you made me cry! What a story and I think it’s wonderful how you recreated the meal from the place they met. Definitely getting a vote from me. Love that you were inspired by your parents’ marriage. Beautiful family, beautiful food. I love the story behind your delicious dinner party! And how neat that they both sent you the same memory. It made me tear up. Good luck in this round! Everything looks fabulous! Hope we both make it to the next round! 🙂 You have my vote! Thanks so much, Jessica! I’ve loved all your posts so far! Thanks, Ruby! I definitely feel like being a REAL person — mistakes and all — is an important part of food blogging! thank you so much for sharing such a sweet story! it made my heart ache for your mom and so happy when i read the ending 🙂 you have my vote! Thank you 🙂 Same to you! Thank you so much!!! I know what you mean about needing help — I could’ve used 8 more hands! What a sweet story, you have my vote. Can’t wait to recreate your sliders, yumm! Julie – have been trying to view this post and comment on it for days, but around National Day in China (Oct 1) internet security always beefs up and I’ve been endlessly frustrated trying to get over, under or through The Great Firewall. Success finally today! Thanks for a lovely post – the first one to bring tears to my eyes….and the food immediately transports you back to the sixties. What a terrific story and what a way to help them celebrate it! Now, you know you will have to out do yourself next year. 🙂 Good luck in round 3! I loved your party, great story. Everything looks amazing. Good luck in this round, you got my vote. What an incredible family story ( even if some things are sad!) and your dinner is a GREAT idea…Pity I was not there!! What a beautiful blog you have and such a touching story. 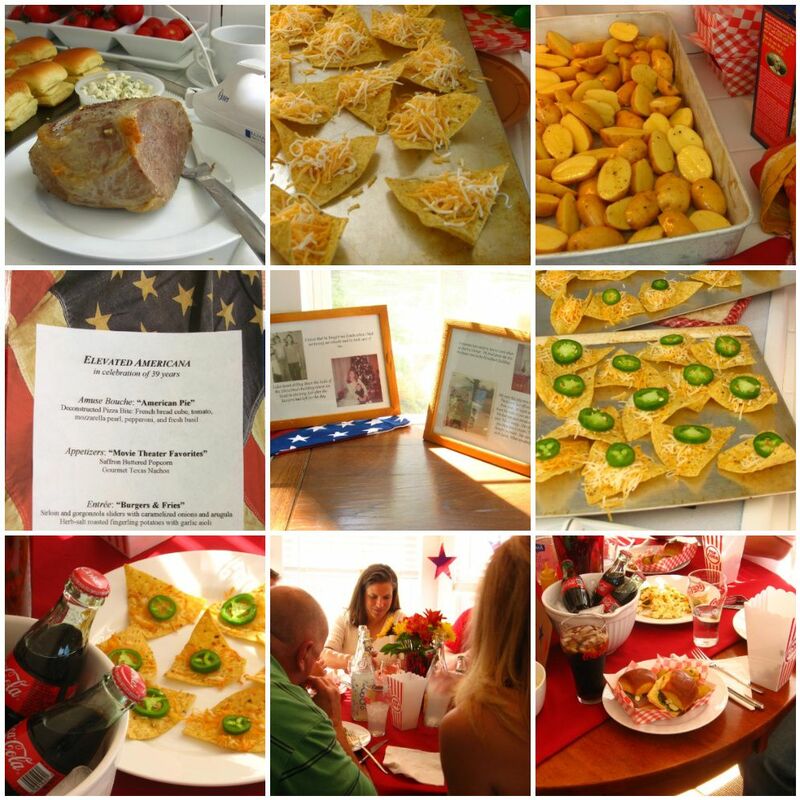 I adore blogs that bring back family history through food. You’ve done a wonderful job on recreating such a special moment in time. Voting for sure! 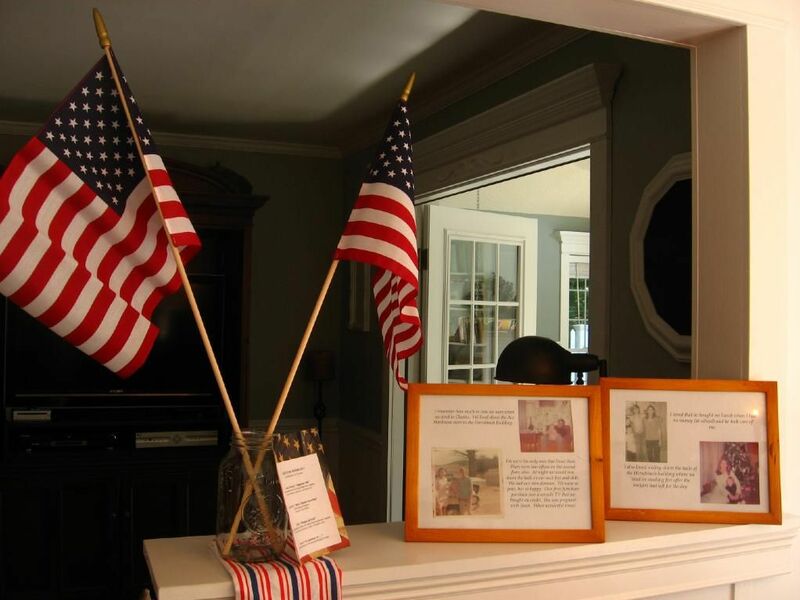 This is such a sweet story, and the perfect way to honor your parents’ marriage. 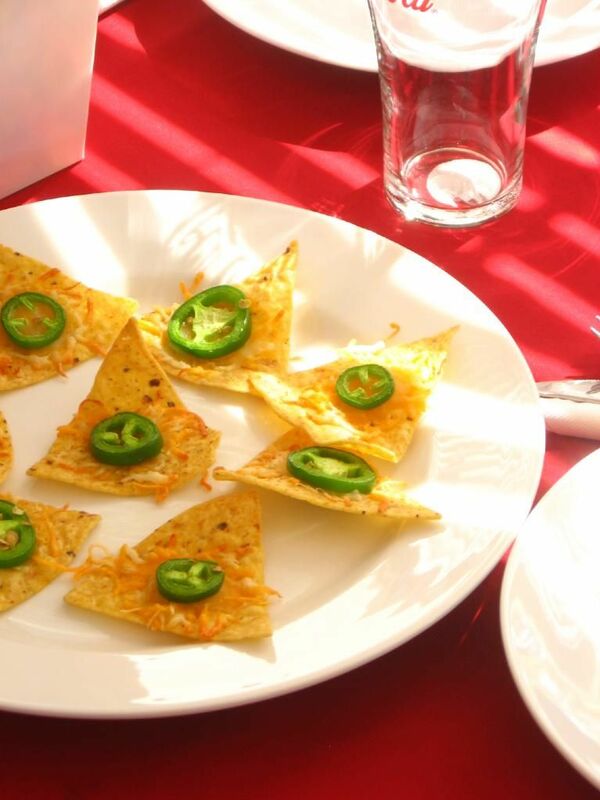 Your adaptations of classic dishes are so creative! I’m voting for you right away! You are quite the popular blogger with this post! I love the party you threw for your parents. It’s upscale comfort at it’s best. great job Julie! Okay…1) this meal sounds amazingly delicious! You are awesome Julie and deserve to win this! 2) that is such a beautiful story about your parents. I’m sad it took me this long to read it. But better late than never right?? Happy anniversary to your wonderful parents! Thank you so much, lovely Maranda!